Years ago I was part of a bead-of-the-month club. As a member, I would receive a box of beads at the beginning of the month. The 12 tiny packages would all have a similar color scheme, and every month I would delight in opening them up to see what that month’s package had in store for me! But sometimes I would open it, and say to myself: uh, I don’t think I’ll ever, ever, ever, ever, ever (you get the idea), use these beads. 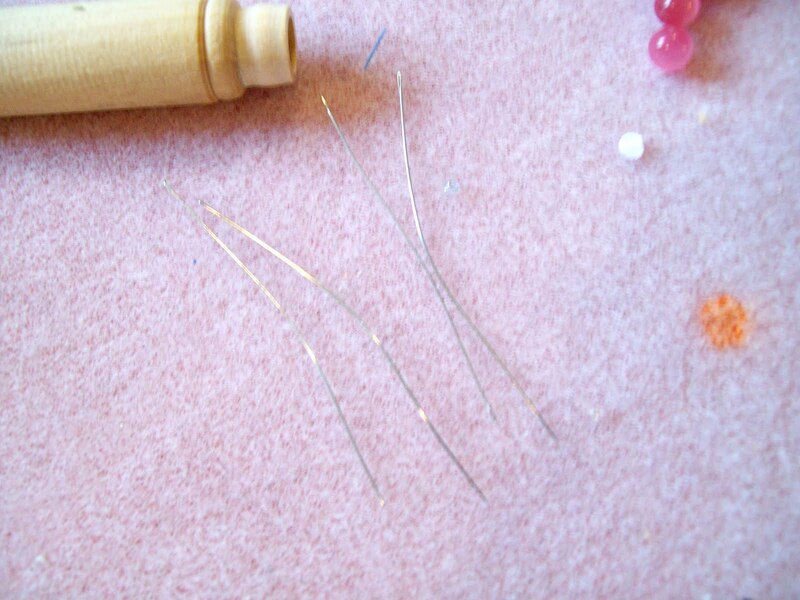 Those beads would be put away neatly on my bead shelves never to be looked at again…..well, that is until I found myself working on a project that required just the bead that I thought I’d never use! It is always a challenge when you are presented with beads you would never, ever, ever, ever, ever, ever use! And so it was, when I received my Art with Heart kit for the Art with Heart beading competition. 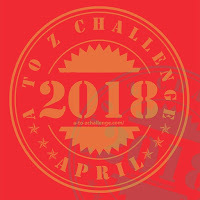 The competition rules require that you use 50% of the beads in the kit, the focal piece, and the "surprise' from the contest organizers stash. 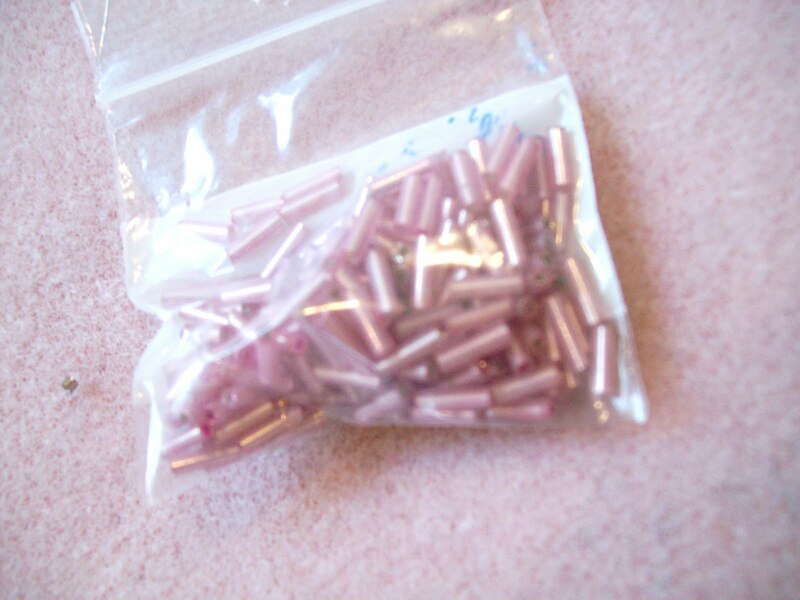 The surprise from the organizers stash was some pale pinkish lavender bugles and some Czech glass beads (and let us file the bugles in the never, ever, ever, ever, ever use category herein referred to as the NEEEEU category). 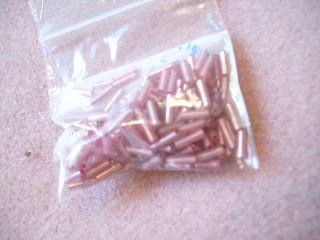 Other beads in the kit included a small amount of bright pink and dark brown Swarovski crystal as well as some pinkish lavender Delicas (let’s put these in the NEEEEU category as well!) and some bluish lined bronze Delicas. However it was the focal piece that held a glaring place in the NEEEEU category!!!! 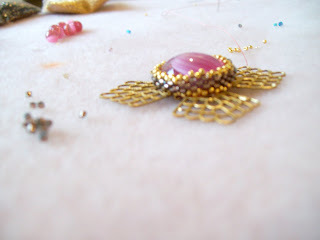 Although I saw a preview on line, I had no idea what I was going to do with the pink cabochon and large gold filigree piece. I mean really – I would NEEEU either of those! 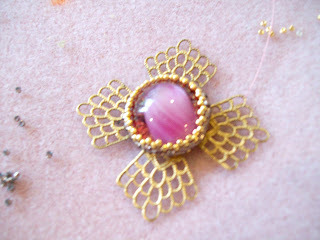 But I decided to finally teach myself how to peyote stitch a bezel set for the cabochon. I stared at the contents of the kit for weeks. Finally in the middle of May I decided to make a bracelet with the kit. I first worked up the cabochon bezel (easier than I expected – kind of made me wonder why I didn’t try this before!) 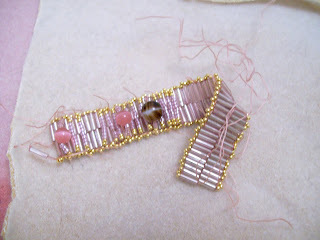 Then I worked up the bracelet. As I mentioned before, I wasn’t crazy about the pinkish bugles, so I made them the base of the bracelet and then started working rows across the top of the bugle base. I COMPLETED the bracelet and COULD NOT EVEN STAND to look at it! 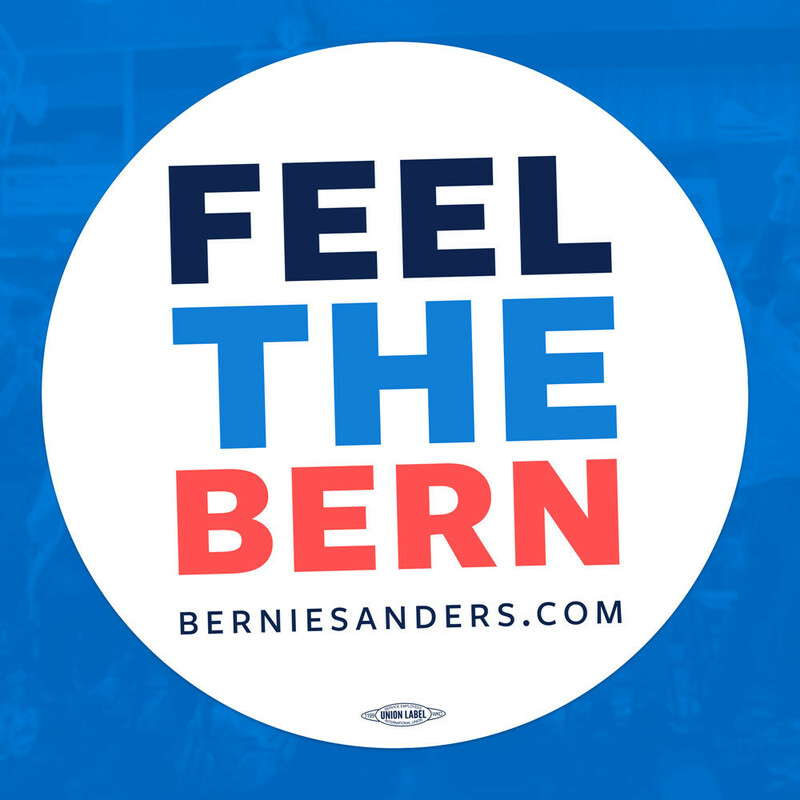 I never loathed a piece so much….so I tore it apart. 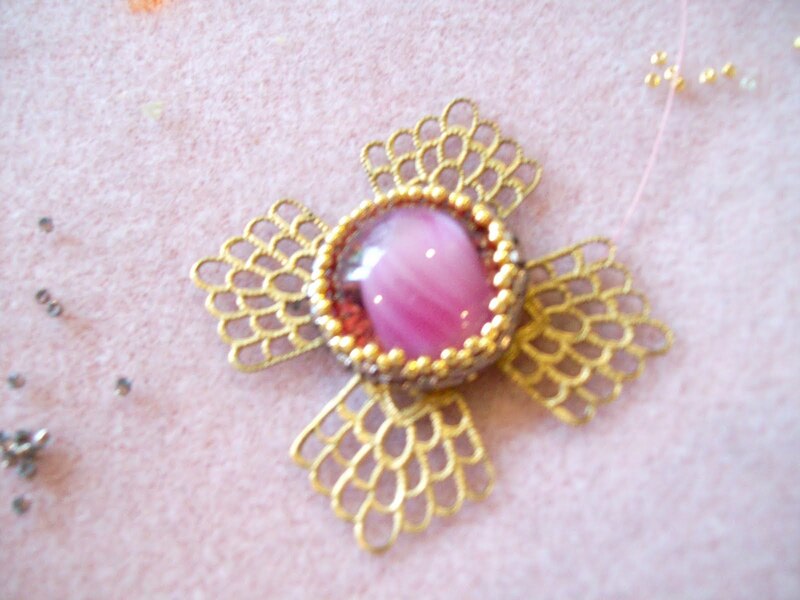 I kept the cabochon/bezel/filigree intact and decided to feature the fiber optic beads that the cabochon kept reminding me of….and finally, came up with this! I like your finished piece. I know what you mean about beads you'd never use. But, it looks like you did a great job with what you had! I'm glad you liked my "transformed" necklace, Amy. I like it much better now, it's not as cluttered.